Pacific Warrior Day of Action! The warriors of Nukunonu, Tokelau show that they are fighting climate change. They’re not about to give up. Today, the world had the opportunity to watch and get inspired by warriors from all over the Pacific Islands that got together to fight Climate Change! While world leaders are talking, and selling out to corporate interests, the Pacific Islanders are watching the water wash their ancestors land away… and they had enough! And it’s super exciting to see that warriors from around the world are coming together and speaking up in solidarity with our Pacific Islanders! Want to know who are the warriors jumping into this fight!? Check out: http://350dotorg.tumblr.com/ And meet the common people, that just like our warriors had enough.. and decided to take on this fight against climate change! Obviously, I’m also in this fight alongside with the Pacific Warriors! 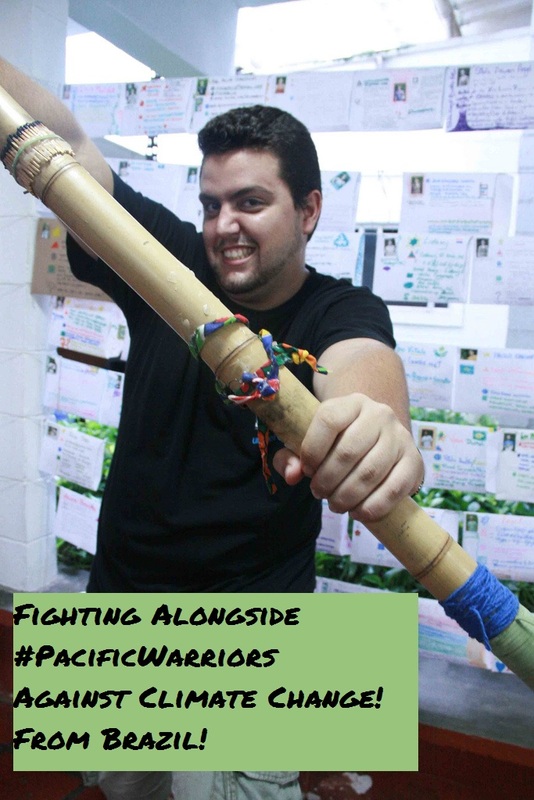 Fighting alongside #Pacific Warriors against Climate Change.. all the way from Brazil! What about you? What are you waiting to join us in this fight? !